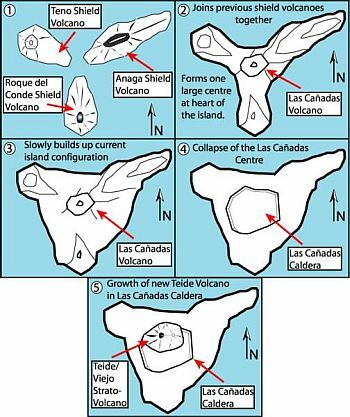 Although headed "Tenerife Geography", the first part of this page is really concerned with "Tenerife Geology", as it tells how the island was first formed. It is well known that Tenerife is volcanic in origin - something to do with the enormous volcano sitting in the middle of it! 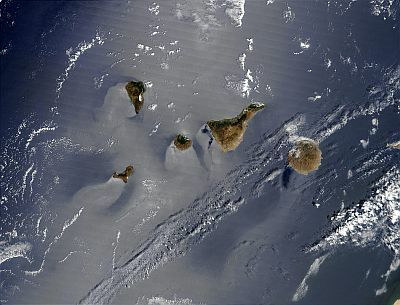 It is a fact that the area where the Canary Islands are found is a volcanic hotspot, with fissure vent volcanoes being the most prominent features. The whole mid-Atlantic can be a bit of an unstable area, by geological standards, due to the presence of the largest mountain range in the world, the mostly submerged Mid-Atlantic Ridge. This enormous feature stretches from somewhere north-east of Greenland right down, way past the tip of Africa, almost as far as Antarctica. It passes right through Iceland and, further south, its peaks break the surface of the ocean here and there, as islands. Examples of these are the Azores and Bermuda. If you refer to the picture, you'll see that the ridge matches the shape of the continents either side of it. It actually seperates two sets of tectonic plates - hence the volcanic activity. The Canary Islands and their neighbours, the Cape Verde islands, lie to the east of the Mid-Atlantic Ridge, near to the African Continental Margin. They are still affected by seismic influences. More volcanic activity followed, gradually filling in the space between these three mountain ranges, forming the "Cañadas Structure". It went through three successive incarnations over the millennia, eventually collapsing in a catastrophic event that produced the "Dorsal Range", over 5,000 feet high and 15 miles long. Concentrations of lava accumulated gradually on either side, punctuated by deep valleys, at the locations of present day La Orotava and Guimar. Volcanic activity continued unabated in the history of Tenerife geography, producing a large dome-like structure in the centre of the island. Eventually, according to the most up-to-date study, this dome collapsed on itself, forming a huge caldera, known as El Circo de Las Cañadas. In the south, there is still an escarpment looming several hundred feet over the floor of the crater. It is thought that this caldera was originally two seperate ones, with Roques de Garcia in between them. 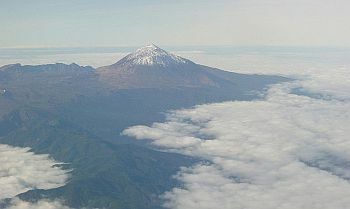 Later still, the present stratovolcano duo of Teide and Pico Viejo was formed at the northern end of Las Cañadas. Further research dates the formation of the present-day valleys of Guimar at 800,000 years ago, Orotava at 500,000 years and Las Cañadas 170,000. It is during these last several thousand years that successive lava flows covered practically the whole of the island, even reclaiming some land from the sea, to create the Tenerife geography we know today. Today, Mount Teide provides useful evidence of the complex geological processes that go towards the formation of oceanic islands. In 2007, the mountain, along with its surrounding National Park, was added to the UNESCO World Heritage Site list for this reason, along with the fact that it is an area of outstanding natural beauty. 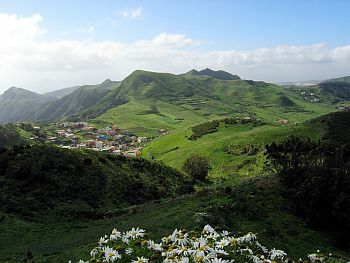 The Canary Islands also has an Organisation dedicated to conservation of important ecological areas. 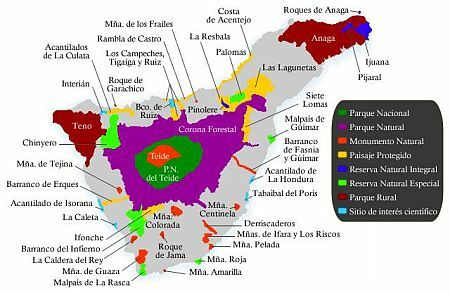 Red Canaria de Espacios Naturales Protegidos, or the Canary Islands Network for Protected Natural Areas has listed a total of 146 important areas across not only Tenerife, but also Gran Canaria, Las Palmas and Fuertaventura. The Anaga Massif is a high, extremely rugged area in the far north east. Reaching 3340 feet above sea level, it has surface rocks consisting of trachyte (remember from earlier on?) and photolite (another type of volcanic rock). Erosion over the millennia has led to a deep network of dykes all across the area. (A "dyke", in this context, is a long, narrow, cross-cutting mass of igneous rock intruded into a fissure in older rock.) Along most of the coastline, the steep cliffs rise more-or-less vertically from the sea. There are a few beaches, some featuring caves and ravines. They are composed of black sand. One of the oldest parts of Tenerife, with rocks dating as far back as 7 million years, is the Teno massif, found on the westerly tip of the island. Here, erosion has caused many deep ravines and the high cliffs on the shoreline extend as far south as Los Gigantes, where they are rightly feted as a tourist attraction. 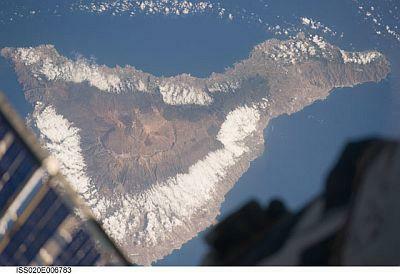 The third massif, Adeje, is found on the southern tip of Tenerife. It has been subjected to more erosion over the millenia than the other two and thus is less rugged, its highest point being Roque del Conde. These are rocky ridges characteristic of volcanic activity. Tenerife has three. Cordillera Dorsal runs from the top of Mount Esperanza to the centre of the island, averaging a height of 2,460 feet. It contains Izaña, the highest point, at 7,700 feet. 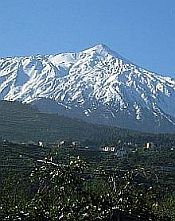 Abeque Dorsal joins Teno with Mount Teide and contains the famous Chinyero volcano. Adeje Dorsal, in the south, once a massive rock formation, now consists of a selection of small volcanic cones. The three main valleys on Tenerife were formed by masses of land sliding, over the millenia, towards the sea, creating giant depressions. As mentioned above, these are Orotava, Guimar and Las Cañadas. Other, lesser, valleys are dotted about the island, but are really originally wide ravines that have suffered erosion over the centuries. Although much of the coastline of Tenerife consists of stark cliffs, there are also beaches covering just over 40 miles of its length. In the north, they consist typically of black volcanic sand. The southern beaches, however, are made from the fine, light-coloured sand, such as you might expect from a beach.